Machines will have personalities, a father tells his students and his young son who’s peeping out from behind the lecture hall projector with wide enquiring eyes. ‘Love.’ The boy answers simply. That’s what is left, she says. In her reasoning this includes God. At this point there seems to be less a disjuncture between cool science, human intuition and religion in this child’s life as there is a small ideological difference between a father and aunt who are, between them, more or less the yin and yang of good parenting. 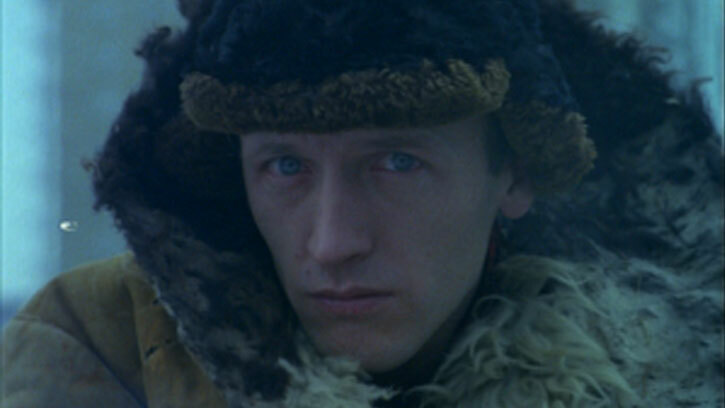 Kieslowski is one of those film-makers who can invest a single gesture with several chapters of back story: A hand slicking cologne behind an ear discretely, a homeless man’s soft, bleak gaze direct to camera. The filmmaker’s signs and portents come thick and fast in this short film and you’ll need to be feeling strong to face the father’s sleepwalk toward suffering: an infant’s innocent question, ‘Is he home?’ Ink spilling, siren sounds. A helicopter whirring at a distance, smoke unfurling from a fire’s embers, the way that corridors shrink, doors close with a clipped sound. The doors keep on closing and we watch the father struggle to not see the evidence gathering for what he already knows. ‘There is no god but God’ is the first in a series of ten interlinked films, named collectively Dekalog, or Ten Commandments. But, in spite of the title, if you’re looking for straightforward religious fare then this film may not be for you. Each Short in the series is capable of holding several different interpretations simultaneously, and this film is no exception: God is love, in the shape of the boy’s warm and intuitive aunt, but also love’s opposite in the man who makes nightly fires by the lake where the children will skate later, and who stares coldly and knowingly at the viewer, wiping away a fake tear in a sinister fashion. Equally, the film could hardly be said to be a polemic about the limits of Science when the father’s failure as a scientist is so singular and striking (he notes the fire, but fails to recheck his safety calculations about the thinness of the ice his child will later skate on). There is also the very human failing of a parent (the father jumps on the ice to test it for his child, but fails to listen to his own unease, ignores his own intuition of approaching danger, perhaps because he sets little store by intuition). And in emotional extremis, he finds he can’t live by his own words about death, “That is it. Nothing. Then it’s over.” But it was early in the day when he chose those words. And he doesn’t exactly have a religious conversion at the day’s end. There is just the struggle. Throughout the film there is somehow always the presence of a crowd: watching, panicking, sinking to its knees in prayer. There’s the comfort of ritual, for the aunt, and the drawing of collective strength from something Other, and this is something which the father always seems to stand apart from somehow, he is alone. We sense a rage gathering in the father, which is exquisitely relatable to the bereaved. It feels just right, somehow, that when the boy’s father finally approaches the altar it is with the aim to just tear it down, but he also seems to find a kind of solace at the place which he has just broken with his own hands. Kieslowski hasn’t constructed a religious allegory here so much as told a very human tale, filled with all the complexity and nuance which the subject of bereavement and loss deserves. In many ways this short film is ahead of its time in its consideration of how technology and humans may interact. Machines, in this telling, seem possessed of almost magical, dare I say god-like, properties. But it will be the humans in the end, with their weakness, love and broken connections, their attachments and their need for meaning, who’ll drive the machines, but also interpret them, and thereby define what the machine is, what we’ll do with it, how we’ll frame it. What we will remember.